Finally, our prayers for wide-spread availability of "green loans" have been heard. The New York State Legislature's recent passing of the PACE (Property Assessed Clean Energy) municipal loan program legislation is good news for all of us who are still waiting for the banking and appraising industries to finally get their acts together and begin to offer green loans and appraisals that take energy efficiency into account as part of their standard operating procedure. It's great news for energy efficiency contractors, renewable energy system installers and companies selling clean energy systems. And, there will be great benefit as well for property owners who can now more easily make energy efficiency improvements and buy renewable energy systems with no money out of pocket, at all, whatsoever. This news is a far cry from the doomsday-like report in the Febraury, 2009 article in the "New York Times" called Dark Days for Green Energy which stated: "...Because of the credit crisis and the broader economic downturn.....installation of wind and solar power is plummeting." Representative Steve Israel (NY 2nd District) recently commented regarding this important PACE program, "I am thankful that Governor Paterson and the State Legislature see the potential for PACE programs in New York and I look forward to working with our local communities to launch PACE bond pilot programs across New York." Based on a financing model originated in the city of Berkeley, California, PACE programs eliminate the upfront cost for energy efficiency improvements and renewable energy systems. Both residential and commercial property owners are allowed to pay for these upgrades with cash borrowed from funds raised by selling low-interest bonds to investors. A PACE bond or lien is a debt instrument whereby the proceeds are lent to commercial and residential property owners to finance energy retrofits (efficiency measures and small renewable energy systems). They repay their loans over 15-20 years via an annual assessment on their property tax bill. For most energy retrofit projects completed with PACE financing, property owners can expect to realize an immediate energy savings of 20 to 40 percent. PACE bonds finance a range of energy efficiency upgrades such as double insulated windows and the installation of clean energy technologies including solar PV panels, solar thermal systems and geothermal heat pumps. “From Long Island to the Hudson Valley, Capital District, Southern Tier and Niagara Falls, PACE financing will enable solar energy projects to move forward without upfront costs and for property owners to make improvements that will pay off in energy cost savings,” said The New York Solar Energy Industries Association (NYSEIA) President Ron Kamen, senior vice president of EarthKind Solar in Kingston, New York. Property owners who utilize PACE financing will benefit over time with real cash savings. The long term repayment mechanism results in annual energy savings that exceed the increased annual property tax cost thus making PACE financing highly attractive to home and building owners. Lowering monthly costs due to energy saving also increases the property's overall value and increases the creditworthiness of the existing mortgage holder. PACE bonds can be issued by municipal financing districts or finance companies. The payment plan for the property owner is transferable to the next property owner if the current owner decides to sell the property. The great thing about the PACE loan program is that States and Municipalities authorizing PACE bonds not only create green jobs, but they have no added debt or credit risk. This is because PACE finance creates no credit or fiscal burden as the entire liability resides directly with those property owners who opt in to receiving PACE loans. It should not be a problem for municipalities to raise funds via PACE bonds as PACE bond holders/investors benefit from a very safe investment given that they are secured by long term tax liens that are senior in right to mortgage debt. 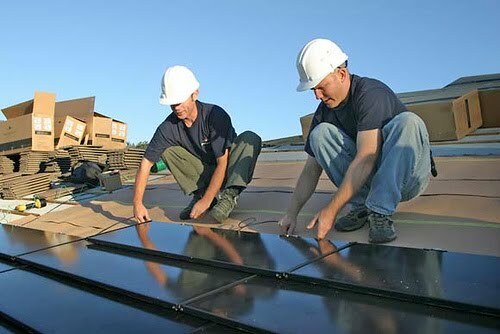 Photo of a group of workers with KPS Solar on Long Island. Kevin MacLeod of KPS in Bayshore, Long Island is Vice President of The New York Solar Energy Industries Association (NYSEIA)and represented the interests of the association to lawmakers who passed the PACE legislation. PACE programs are a recent innovation in finance and have emerged nationwide over the past year during which time 15 states have passed enabling legislation. Current PACE-enabled states are: CA, CO, IL, LA, MD, NV, NM, NY, OH, OK, OR, TX, VT, VA, & WI. According to PACE Now, an independent coalition of PACE bond supporters, it is estimated that the potential for PACE bonds could exceed $500 billion nationally. An additional benefit to the PACE legislation is that it allows municipalities to leverage federal funds in order to provide loans to commercial and residential property owners to finance energy efficiency retrofits and renewable energy systems. "New York State can now tap critical federal dollars to create much-needed jobs with PACE programs," said Jack D. Hidary, Chairman of Americans for Clean Energy and one of the leaders of the PACENOW coalition. He added, "PACE will put more people to work and will bring energy efficiency and solar to buildings across the state with loans that make it easy for owners to pay for this cost-reducing work." “By passing the municipal sustainable energy loan program bill during the extraordinary session, we are putting New York municipalities in a position to compete for $454 million in federal stimulus funds,” U.S. Congressman from New York, Steve Israel said. “PACE programs will save home and business owners money, create new sustainable green jobs, bring clean energy companies to the State to compete for our business, and help wrench New York out of this painful recession. Governor Paterson said about PACE: "Now, thanks to the leadership of President Obama and Congressman Israel (U.S. Representative Steve Israel NY 2nd District) the federal government is offering programs that encourage the use of PACE loan programs ... I want to thank the Legislature for recognizing this opportunity and for agreeing to pass this critical legislation." One of the most progressive things about the PACE program is it makes the whole debate about the unavailability of "green loans" and energy efficient mortgages out of date. With funding from PACE bonds, homeowners are able to borrow money to make the necessary improvements to their homes without the hassle of finding a lender who is familiar with green lending principles. It also puts the concept of a green loan right where it should be by defining financing-worthy green home improvements as ones that result in concrete energy savings that reduce monthly cash overhead, thus being good for the bottom line while protecting the environment. If you want to become inspired to install some renewable energy systems, check out the AMAZING VIDEO below about the 2009 Solar Decathlon House designed by Team BeauSoleil from the University of New Orleans at Lafayette. This affordable, self-sufficient home can be elevated in flood prone areas, withstand hurricane force winds and is powered entirely by the sun! This is great news for the industry, as you note. One additional point, the New York Solar Energy Industries Association (NYSEIA) laid the groundwork for this by writing the New York legislation previously known as the "Green Loans Bill" that evolved into PACE as the federal government launched their national program. Home solar panels are smaller and inexpensive nowadays, while the rewards have grown exceedingly. The amount of energy that is produced by solar panels is influenced by the quality of the panel, the materials and technology that are used in making the panel, and the amount of time the panel has been in use.